I originally shared an almost identical version of this last summer, but guessing its new to most visitors here. 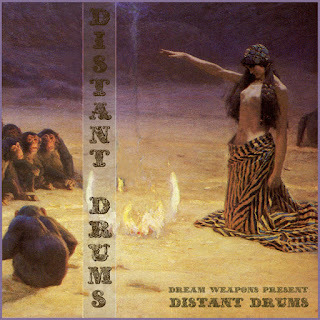 Distant Drums is my attempt at compiling an exotica or rather just an exotic-sounding mix - or maybe a few tunes here simply remind me of the sun and the ocean. Anyway I decided not to allow myself to include any of the usual suspects - and leaving out any favorites discovered on Flash Straps (highly recommended blog!) many rips and mixes. I almost succeeded on both accounts. I've loved the sound of this criminally underrated genre ever since I got Martin Denny's A Taste of Honey for free at a flea market a little over 20 years ago (hardly exotica and far from being among his best, but it did the trick). So here's a light, gentle and deliciously inauthentic 90-minute tour around everywhere in the world westerners consider east or south. -old fiend! I might just steal that and use it as a title for a mix ... or a painting + perhaps some of those Free Owl Sounds-downloads might come in handy. Thanks to you all as well! Supportive comments means a lot. Its good to hear from some guests that they're not only downloading - but also actually enjoying the music.